How do you choose to present yourself to the world? Is it through how you dress? What you own? Or just generally how you appear to others? These things aren’t everything, but a first impression goes a long way! This is a concept that has existed throughout human history. Adorning yourself with material goods has long been a strong indicator of status; especially when those goods are made from precious metals or jewels. Silver and status are intrinsically linked. Some societies were so protective over the ‘silver = status’ link that tight restrictions have been put on the purchase of silver. Take Massachusetts during the 17th century for example… A law was passed stating that you could only wear gold and silver buttons if your estate was worth at least £200. So even when silver prices were verging on the affordable, the status that came with it was preserved. The three main ways we can relate historical status to silver are by looking at: ‘Grave Goods’, ‘Domestic Plate’ and ‘Civic Regalia’. As the name suggests, this term refers to items that are found within graves or at burial sites. When researching ancient civilisations, grave goods are one of the best means we have to understand how they lived. During the ancient Egyptian times for example, the bigger and better the grave, the higher the status of the deceased. In accordance with Egyptian beliefs, people were buried with silver and gold for practical as well as symbolic reasons. They believed that these high value goods could be offered as gifts to the gods Osiris and Ra, granted passage into the afterlife. 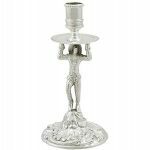 Silver had an additional reason to be worshiped within this culture: it was believed that the bones of the gods were made from this precious metal (and status doesn’t get much higher than the Gods!). The burial site or Ur in Southern Iraq provides another amazing example of silver grave goods. Over 1,800 graves were discovered during the excavation, which began in 1928 by Leonard Woolley. Of these 1,800, 16 were very unusual. It became clear quickly that these 16 graves belonged to people of extremely high status. These graves (dated 2600-2400 BC) contained silver ornaments, jewellery, dishes and musical instruments. The deceased had also been buried along with 74 personal attendants. It is still unknown whether these people had been royals, or perhaps important figures within a religion. We can certainly be sure however, that they carried grand status. Yet another burial site where impressive examples of grave goods were found is Sutton Hoo, located in Suffolk, England. Perhaps the most magnificent discovery of this excavation was a large burial ship. The connection between death and boats has long been well established. Greek and Roman myths for example, talk of Charon- ferryman of the underworld- ferrying the deceased across the river Styx on his boat. Because of the mythology, ship burials were not uncommon. The ship at Sutton Hoo however, was something special. It contained the largest amount of silver ever found in a grave. This included 10 shallow bowls, 2 spoons, dishes, a bowl displaying a classical head in profile, a ladle and a plain cup. This burial must have been conducted by a family or community so affluent that they could afford to bury so much of their silverware. What a way to prove immense status and wealth! Upon the rise of Christianity in Europe between the 6th and 16th centuries, the custom of grave goods became almost extinct. Because of this, we must look elsewhere to evidence the link between silver and status over these centuries. Written records, hoards and church collections are all good places to start. After the reformation, silver became less exclusive to the highest realms of society, but it was still used as an indication of wealth. During the Tudor period, monarchs would exchange gifts of silver in order to impress on important occasions. 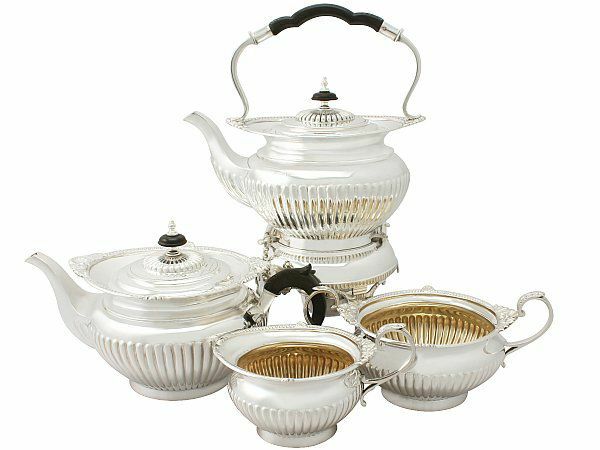 In addition, silver would also be used to entertain high class guests. At this time, fine dining customs had been imported from the French aristocracy. It was custom the present your guests with a buffet-served on fine silverware of course- and the more extravagant the better! People proved their status by arranging exuberant displays of silver. They would often even use ‘table architects’ to coordinate their collection for them. Silverware collections would grow and grow as there was an unspoken element of competition surrounding these buffet displays. Furthermore, when new food types were introduced to the British dining scene, silverware had to adapt. When tea and coffee became popular for example, a whole new array of serve ware became necessary. Only the wealthy could keep up with these ever changing trends! Of course, changes in silver manufacture had an impact on its high status role. The invention of rolling mill (circa 1740) and the development of silver plate (around 1743) both made silver more affordable and accessible to the masses. No long did shiny metal necessarily equate to wealth and status. 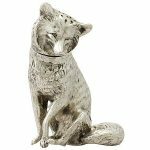 Traditionally, silver has also been used ceremonially to represent status and authority. Prime examples of this are the use of silver by large societies or prestigious universities such as Oxford, Cambridge, and Harvard. Formal dinners to signify important events or dates will often feature extravagant silverware. The Lord Mayor of London’s annual dinner is a perfect representation of this. In Britain, silver is an important part of mayoral regalia (items that express the importance and authority of a town’s mayor). Perhaps the most important example of this is the silver mace that most towns will own. The mace, which was originally used as a weapon, has since been repurposed as a signifier of office, and is used as a symbol by many British officials. It is the silver mace that gives mayors the authority of legislation- granted to them by the crown. 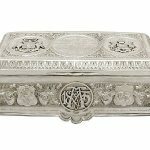 So, whether a piece is of monetary value, symbolic authority, or the thing you wish to take to the grave, there is no doubting the historic importance of silver. An impressive signifier of status and wealth… no wonder silver items are still so sought after today!